This is some type of multi-functional gaming device which named Fly Mouse. As the name mean, the device shows its flexibility while playing a game, like a flying mouse. To be specific, the remote control function of Fly Mouse enables the users to play a game on the sofa or bed with the posture of lying or sitting or standing. Moreover, the design of Fly Mouse also includes the integration of a keyboard and gamepad key presses, which rapidly fire up the passion of gamers and became a best-seller product. Fly Mouse is undoubtedly an innovative design of gaming device which involved both the combination of mouse and keyboard and other game pad functions and a cool appearance design. However, for manufacturers, the testing of whether the function or the appearance design is necessary before the mass production. Prototyping is such an industry that can satisfy product manufacturers with its requirements of testing a product. A structure prototype is designed to test the optical and tactile feeling users might cared, and it is also a decisive factor of function design. Let’s have a look at the processing process of designing a Fly Mouse prototype, and see how important it is in the production of the real application. The prototype uses ABS plastic as main producing material to ensure the heat-resistance and adopts CNC vowin.cn/en/News/news1251.html' target='_blank'>machining as processing method to ensure the accuracy of some high-precision required positions. 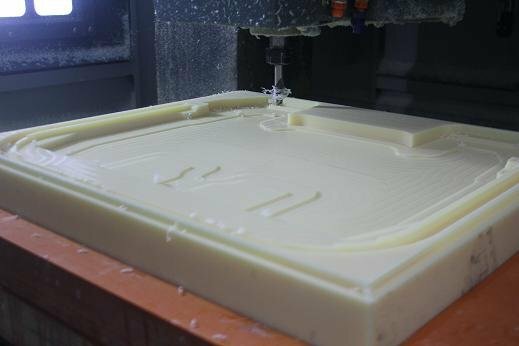 When the prototype is firstly shaped, a manual post-production process will be processed to remove the debarred edges and smooth the surface. Based on the previous manual operations, the paint process can be conducted fluently. In other words, if the surface of the object is not smooth enough, the flaws can be extremely obvious after painting. Afterwards, if the painting can be processed in good conditions, the customer might demand a further operation like silk printing for a logo marking or some other patterns. Or, a glossy painting might be processed according to the requirement of shining surface. For the first cooperated customers and the new designed project, a related 3D format design drawing or drawings is required for quotation and manufacture. On the other hand, 3D files plays an important role in the production of prototypes due to the Computer Numeric Machines should follow strictly by the design path or we call the figures of the prototype. Then, basically the sample will produced within 3 to 5 days for assessment before a small number of prototypes were made.